Discover | Explore | Savour Great Food At Any Time! Sit Bao Mang, the Hakka equivalent of "Sik Bao Mei" in Cantonese or "Have you eaten" in English. Reason of the name is that the writer puts much pride in his clan heritage; hence the name of the blog. Like any other chinese clan, Hakkas put much emphasize on their food; which boils down to how important does food taste and mean, no matter if it's a fine dining cuisine; or a simple hawker fare. Good food, from every nook and cranny will be discovered, experienced and shared. After so many years of experience eating one of the best food found found in Malaysia, doubtfully the nasi lemak; I have concluded that I actually have found the best one! I'm sure you could say that nasi lemak is one of the favourite dish for all Malaysians and is eaten for breakfast, lunch, dinner, supper; anytime of the day. This Indian stall here in Seapark (SS21) prepares a great tasting and aromatic nasi lemak which I enjoy and have often cravings for. The stall has no specific name since it's a nightly rented section of a coffeeshop named Sun Fatt Kee. I simply called it 'Seapark Nasi Lemak' whenever I mention to friends; while I heard other names like 'Pelangi Nasi Lemak' (a snooker centre named Pelangi nearby), 'Maybank Nasi Lemak' (Maybank beside) or 'Sun Fatt Kee'. If you happen to pass through this stall by driving, just slow down and look thoroughly at what most of the patrons are having. I bet 99% are having their specialty, nasi lemak ayam! In my opinion, what makes a good plate of nasi lemak would be it must have fluffy and aromatic white fluffy rice cooked with coconut milk. The sambal would be the other requirement; just spicy enough to compliment while retaining the rice's flavor. The condiments (anchovies and peanuts) must be crunchy. Not to forget, it must be served piping hot. That said, I felt Seapark's nasi lemak has met all the above requirements. The rice and the sambal totally passed the passing grade with flying colors. Do note however the sambal version of this store is a little sweet; but I honestly loved every bite of the rice and sambal combination. The fried chicken; is one of the crunchiest one could find in mamak stall's quality! I sense herbs to produce the great marinating recipe in it. Sunny side up egg was cooked perfectly the way it should be. 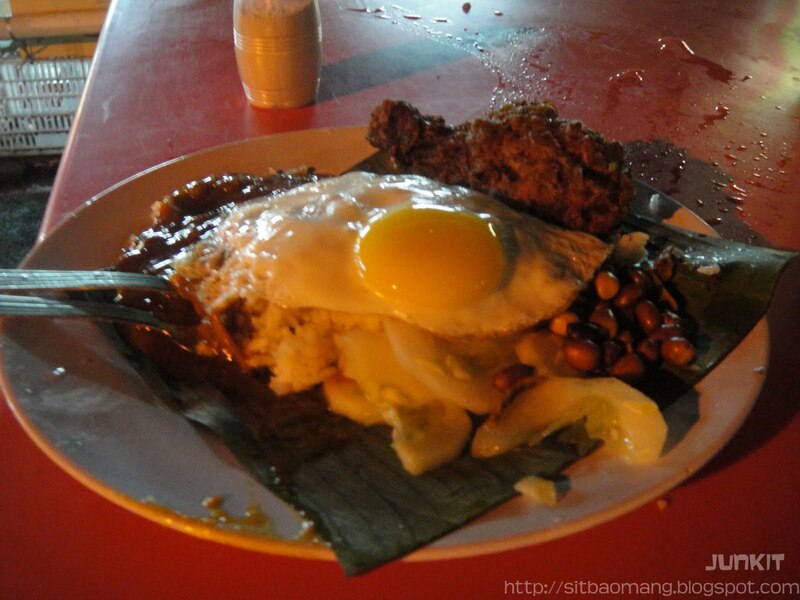 The nasi lemak is also served on banana leaf; which brings the flavor out! My relative from Singapore even complimented that the nasi lemak here is better than Madam Kwan's, which prepares the more 'premium' version. Iced milo and iced limao. 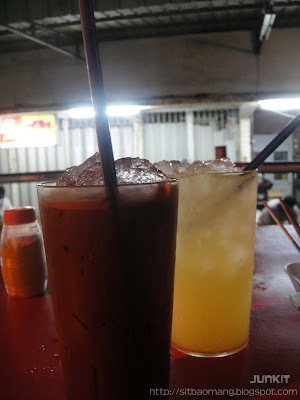 Quantity and quality like what you would find in normal mamak stalls. The section where they prepare your dishes and drinks. 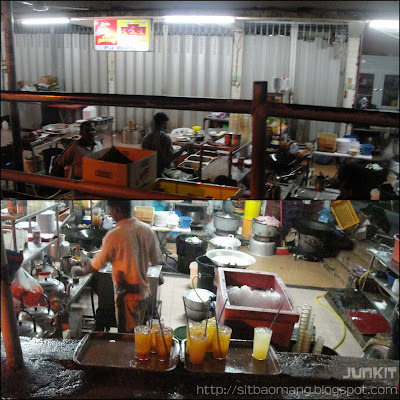 It's pretty amazing that since they are always busy with orders coming in, they had adopted the specialization method whereby one person would fry the eggs only, the other frying chickens, frying noodles, etc. Some may argue that the place is not that hygienic, but well, good food comes in all kind of place right! What's more I've seen worst kitchen environment in some closed kitchen with a very high end type dining places. Seapark nasi lemak is very easily located; being nearby SS2. Do google map for SS21 or Seapark to get directions from your location!